Elaine's Sweet Life: Doughnut or Donut? Well, however you like to spell it, they should always taste delicious! 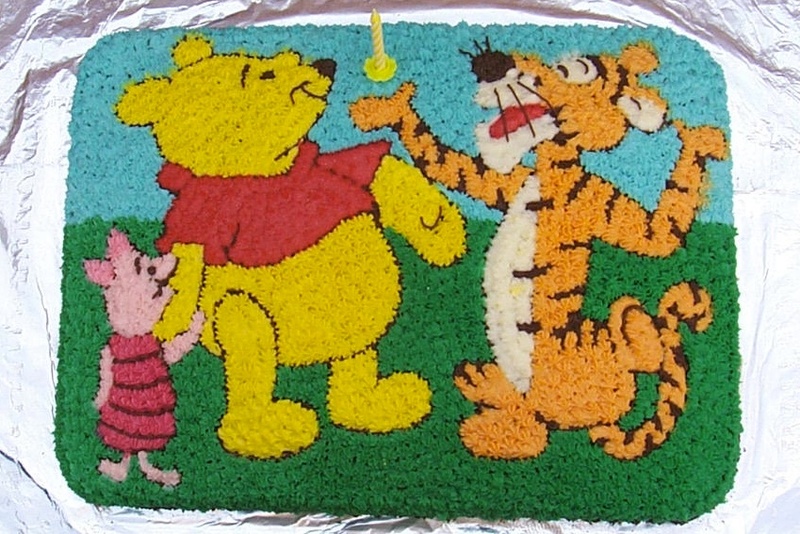 My first, ever, decorated cake for my son's 1st birthday (he is 16 now). Over the last week I have tried making a yeasted dough glazed ring and a glazed chocolate cake doughnut. I used both recipes exactly as they were written for my first attempts (well, mostly), as I've not made them before and don't know how the doughs or glazes should look or feel. 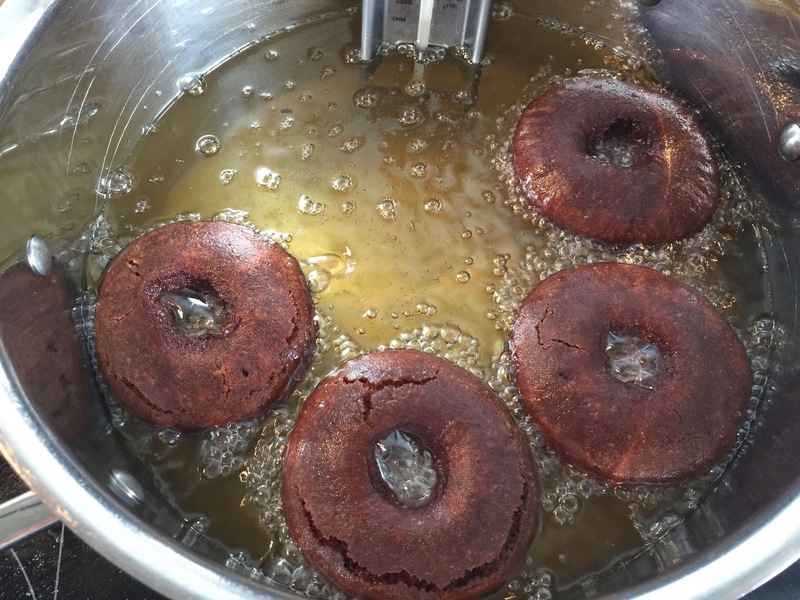 First up are the yeasted dough Glazed Ring Doughnuts. These came out looking pretty good. They were nice and puffy, but they were too chewy to me and I didn't like them. 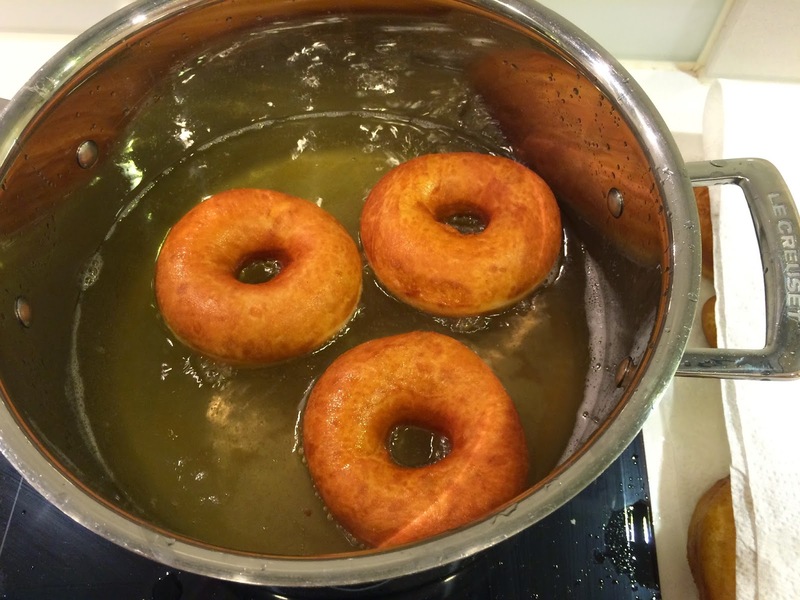 My husband actually liked the chewiness, but still agreed they didn't taste quite right - they tasted more like vetkoek (another, usually savoury, South African treat) than actual doughnuts. The glaze also wasn't quite right as it stayed sticky and didn't crust over as I would expect. My seminary students, however, enjoyed eating them as an early Friday morning treat to go with their hot chocolate. The dough was completely runny after bringing it together, so I used my best judgement and added some more flour (the amount of yeast called for was quite a lot, so I felt it could deal with the extra flour.) Even after rising the dough was still very loose and I struggled to maintain the shape of the rings when cutting them and moving them onto trays. I probably should have floured the trays, as they stuck quite badly where the cut edges came in contact with the baking paper, but the recipe just stated to put them onto baking paper, so thats what I did. After proving, the dough was still looser than I anticipated and it was really hard to keep the doughnuts round getting them into the oil, and some of the holes tried to stick closed. But they puffed up beautifully when cooking and most of them came out pretty round (some of them were decidedly misshapen though, I wish I had taken pics of them). The round ones looked great with the classic light band around their middle. I'm not happy with this recipe though, so I'm not going to share it. 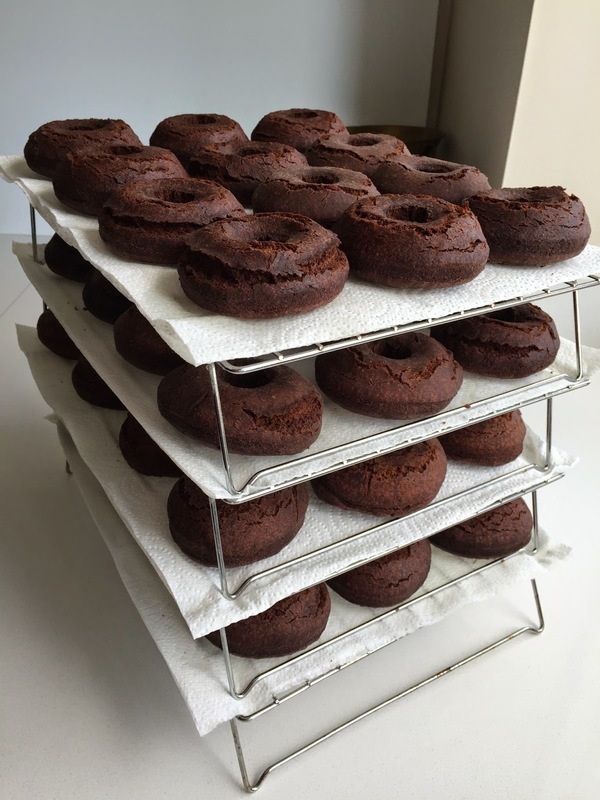 Next up are the Glazed Chocolate Cake Doughnuts. These too came out looking great! The flavour was perfect, but the cake was a little bit dry and heavy. This glaze tasted good too and crusted over perfectly, but was just a bit too thick and didn't go clear as promised in the recipe (but this is would probably be fixed by thinning the glaze down a bit more). I did enjoy eating these very much, but they will need a bit more work to make them really delicious. You can find the recipe by Lauren Weisenthal here. This dough is made with baking powder rather than yeast, so only calls for a couple of 10 minute standing periods and doesn't begin rising until it hits the hot oil. 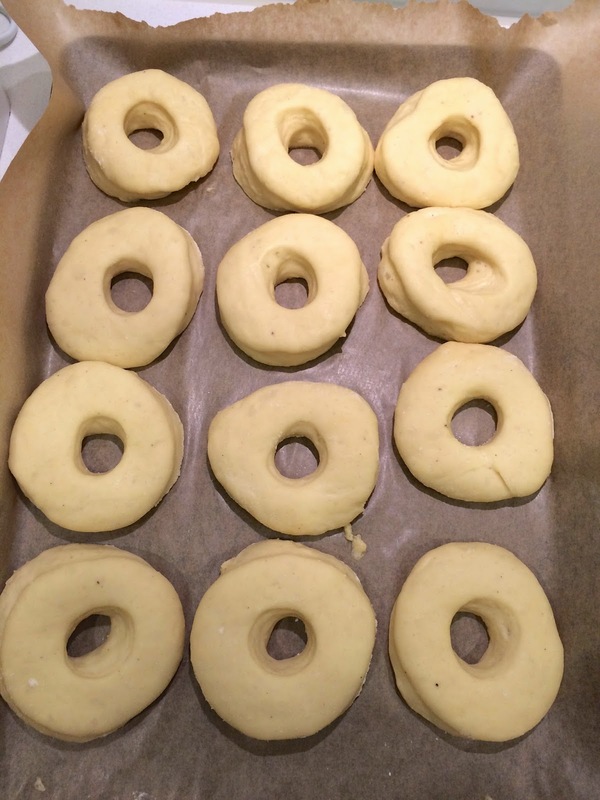 The dough was very, very sticky, and though the recipe encouraged the use of plenty of flour when rolling and cutting the rings, I didn't use enough and they stuck irretrievebly to my counter top. I therefore had to reform the dough and roll it out again. This could possibly account for the slight dry heaviness of the cake (the recipe warns against overworking the dough). Frying them was quite hard because of their dark colour. 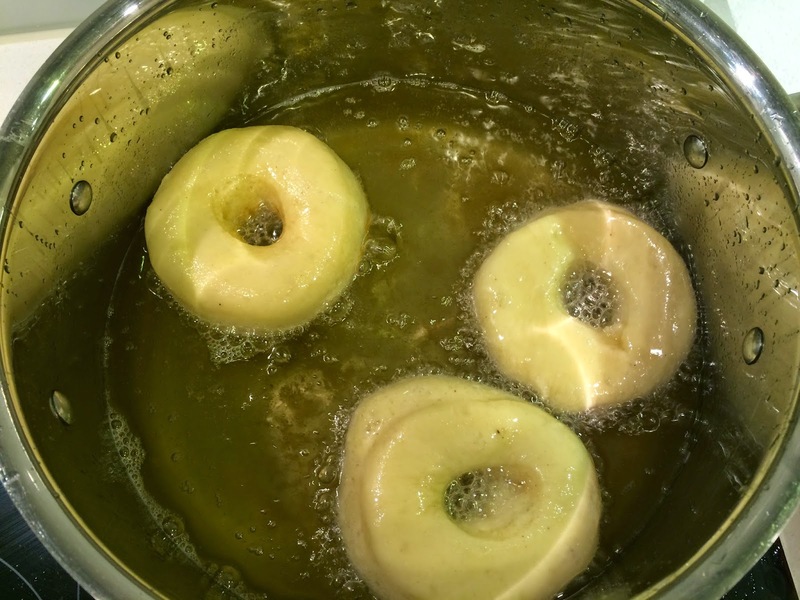 I found I had to actually set a timer to cook them consistently and had to watch my oil temperature like a hawk, because if the oil was just a little to hot, or I cooked them just a little too long, they got a slight burned taste to them and the tops didn't break open. A bit more attention and experimentation with the cooking process may also improve the texture of the cake. These were devoured by our roadshow participants at our rehearsal last night. If you can recommend a recipe for me to try, I'd love to see it, and if I like it I will share it on my blog. Please leave a comment below!